If you've found yourself here it's because you're holding a Limited Edition Collector Story Card. You've either been given one by the author, or you've found one. But, what if you're here because curiosity made you look - well, then you're also in for a sweet surprise. Let me tell you what a Story Card is - and, what it means to have a Limited Edition Collector Story Card. 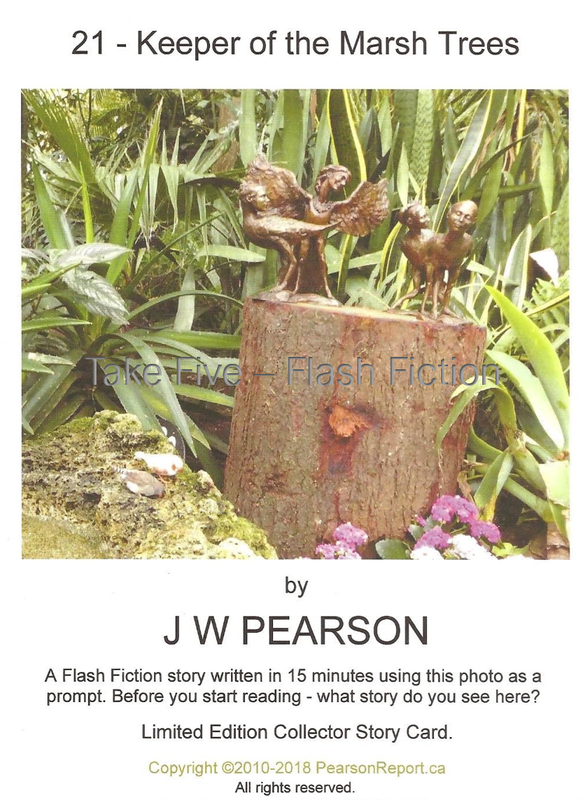 I write Photo Prompt Timed Flash Fiction - a bit of a mouthful, but what it means is I write Flash Fiction using a Photo (from my personal collection only) and I write in a time limit of 15 minutes. What comes of this exercise is what you will find on my Story Cards. Now, here's the fun part about the Limited Edition Collector Story Cards - they have a value, particularly this first one #21 - Keeper of the Marsh Trees - which has a limited run of 100, of which 50 are signed by the author. These are going to have a special purpose, so if you're in possession of a signed card - hold onto it. The signed Story Cards are your ticket to my VIP Book Launch - yes, that's coming soon. In the meantime, have fun with my Story Cards - take them to parties, gatherings, family affairs - they are great dialogue starters - and finishers! Well, before anyone gets to read the story on the back of the card (yes, the full story is on the back) get everyone discussing what they think is happening in the photo. - What does the photo bring out in your imagination? - What story do you think lurks within it? - Also, play a game where everyone contributes a sentence as the picture goes around the group building a story as each sentence is added. Then see if it's similar or very different from the actual story. When you get around to reading the story on the back that's when the fun really gets going. Well, as this story comes from the author's imagination it may be totally out in left field for you. So here's where you get to decide if you'd add or take away from the story - and how about the ending? Does it leave you hanging? If so, how would you end it? This provides all kinds of interesting opportunities to have others contribute their ideas for an ending. The options are endless, as you'll soon find out. Give it a try - if you don't have your own Story Card for #21 - Keeper of the Marsh Trees I have provided it HERE on this blog for your enjoyment. Please pay attention to copyright - you are welcome to share a link to this page, but copying and reprinting it for any publication, print or online, is strictly prohibited.